As a fan of two other McLain novels, Circling the Sun and The Paris Wife, I knew I had to get my hands on Love and Ruin. It didn’t happen as fast as I would have liked, but I finally found an audiobook version through Libby. I admit, I may have audibly squealed when I got the notice that my hold arrived. Before I jump into the novel, I have to say a quick word about The Paris Wife– I loved Hadley, Ernest Hemingway’s first wife, and it broke my heart to read McLain’s version of the dissolution of their marriage, and to hear how Hemingway treated his wife. Going into Love and Ruin, I already had some stored up resentment towards Hemingway. I mentioned in my last McLain review that Ernest is a Leo, known for being attractive, confident, passionate, and charismatic. However, they have a dark side, in which they’re egotistical, demanding, impulsive. (You may not believe in that information, though I find it to be strangely true, so I digress). Hemingway possessed all these traits, and pulled people with a magnetic force into his orbit, easily attracting Hadley. Sadly, he was equally talented a pushing people out, and in his case, pulling other women in. Ernest divorced Hadley and married Paulline, whom Hadley pretty much conceded to. They had two more children in addition to Hadley’s son, and though he was a good father, his eye didn’t cease to wander onto other women. Especially when Martha walked in. Martha “Marty” Gellhorn, a young journalistic writer/reporter, was with her mother on a brief vacation to Key West in between assignments when she walked into the same pub as Hemingway. She’d traveled all over the world as a foreign correspondent, as well as covered the effect of the Great Depression in the US, writing and trying to advance her career. Privately, her paramours were but whirlwind romances, but when she met Ernest, her idol, things seemed different. Martha knew he was married, but he was so charming, so charismatic… she knew that they were falling for each other, and that they were doomed from the start. When Ernest headed to Spain and told her to meet him there, she knew she had to follow him. Trying to keep their attraction secret, she found a professional reason to travel to Spain, as a correspondent for Collier’s Weekly covering the Spanish Civil War. However, being in proximity to him in such dire times only seemed to bring them closer. Conflicted, they said painful goodbyes before she traveled on to report the rise of Hitler and the conflicts in Europe, while he returned to his wife to work on a new novel. Eventually, Ernest persuades her to come live with him. They settle in Cuba, and he divorces Paulline to marry Martha. Living in a tropical paradise, they each begin writing- For Whom The Bell Tolls by Ernest, and A Stricken Field by Martha. Throughout their writing processes, there’s competitive tension that strains their marriage. Once published, Hemingway’s novel booms, and Martha’s novel is snubbed, considered having too much influence by her husband. She is left feeling like a footnote in his life, assuming that she may never stop being compared to him. Determined not to stay in his shadow and proving her talent, she leaves again for Europe, joining the men in the trenches during WWII. Reporting where women weren’t allowed was both dangerous and thrilling for Martha, and the love of her career volleyed with her love for her husband. Eventually, she had to choose- which one did she love more? Yet again, McClain has blown me away with her strong female lead and her beautiful, lyrical writing. She has also made me disdain Hemingway and adore his third wife. Gellhorn was an impressive woman- strong, smart, adventurous, brave. I understand how she didn’t want to be known as just Hemingway’s third wife, because she was so much more- a world traveler, a fearless reporter, a compassionate woman. Despite her love and admiration for him and his talent, she would not let Ernest manipulate and control her (despite his best efforts). 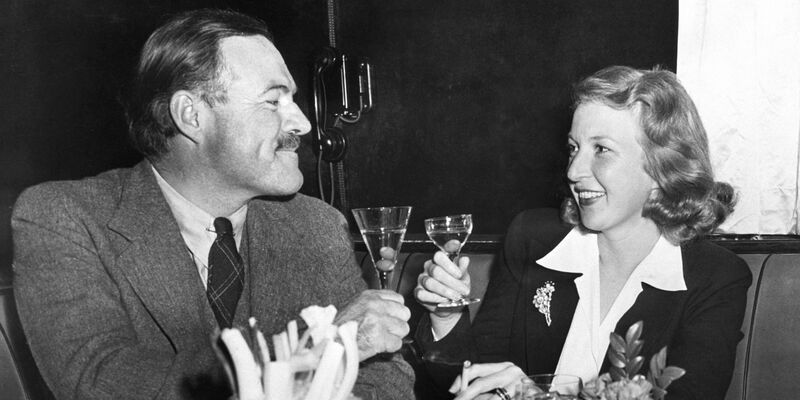 Gellhorn would not let a man dull her shine. McClain’s account of their dramatic, roller-coaster relationship is absolutely worth the read. Love and Ruin has certainly put a strong bid in for personal favorite of McClain’s novels to date, and if you haven’t read her work, I highly encourage you to do so. Fans of historical fiction or love/relationship novels will definitely enjoy as well. I also recommend the audiobook- the narrator, January LaVoy, perfectly emulates the conviction in McClain’s narrative.